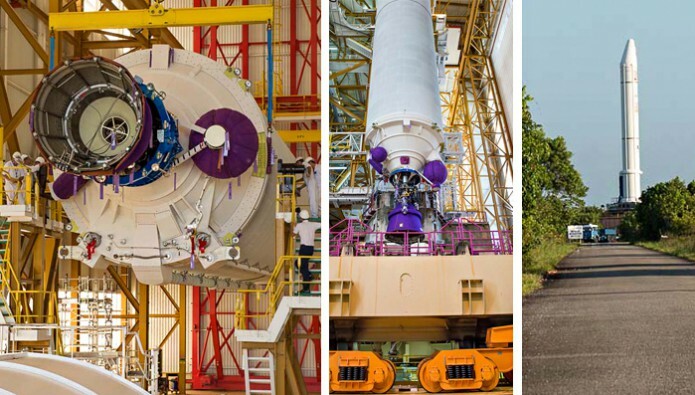 Ariane 5’s cryogenic core central stage for Arianespace Flight VA227 is removed from its protective shipping container (photo at left) and raised into position over the launch table in the Spaceport’s Launcher Integration Building (center photo). At right, one of the Ariane 5’s two solid propellant boosters rolls out for integration with the core central stage. The Spaceport’s ability to conduct two parallel Ariane 5 launch campaigns is being demonstrated again as a new heavy-lift launcher takes shape for an Arianespace liftoff from French Guiana in November, which will carry the Arabsat-6B and GSAT-15 telecommunications satellites. During activity in the Spaceport’s Launcher Integration Building, the Ariane 5 for this upcoming mission has undergone the first build-up steps, with the core cryogenic stage positioned over one of two operational launch tables and the mating of two solid propellant boosters. It will be followed by installation of the cryogenic upper stage. The November mission with Arabsat-6B and GSAT-15 is designated Flight VA227 in Arianespace’s numbering system, signifying the 227th launch of an Ariane vehicle since the series of European-built launchers began operation in 1979. Once the Ariane 5 for Flight VA227 completes its build-up and checkout by prime contractor Airbus Safran Launchers, it will be ready for transfer to the Final Assembly Building, where the Arabsat-6B and GSAT-15 passengers will be installed under Arianespace’s responsibility. The Spaceport’s Final Assembly Building currently is occupied by an Ariane 5 for Flight VA226, which will roll out to the ELA-3 launch zone tomorrow, September 29, for liftoff September 30 on another dual-payload mission – carrying the Sky Muster and ARSAT-2 relay satellites. Both payloads on Flight VA227 in November are for long-time Arianespace customers, continuing the company’s relationships with Arab nations and India. Arabsat-6B is a sixth-generation satellite for Arabsat – the inter-governmental organization founded by the Arab League in 1976. The spacecraft was built in a consortium led by Airbus Defence and Space, supplier of the Eurostar E3000 platform and the satellite’s integrator; along with Thales Alenia Space, which designed and built the communications payload. Weighing in at a liftoff mass estimated at 6,100 kg., Arabsat-6B will provide telecommunications and TV broadcasting services for the Middle East and Africa. Flight VA227’s other payload, GSAT-15, was developed by the Indian Space Research Organisation and will deliver C- and Ku-band telecommunications services. GSAT-15 will have a liftoff mass of approximately 3,150 kg.